For backers outside Taiwan, please kindly refer to International campaign page. HappyLand is going to ship! I’m glad to announce that “Wake me up at HappyLand” is going to ship! Everybody will receive the book soon. Ps. If you are sponsor for notebook, tote bag and strap, please be patient and we will be shipping on June. Thank You! And You! And You too! Whether you have backed the project, shared our campaign, or simply liked the story, I thank You from the bottom of my heart. We have hit 100% of the target with 2 more weeks to go. Pls continue to support us and bring 《HappyLand》 to many more! FREE 「Taiwan-themed」 postcard to all backers! 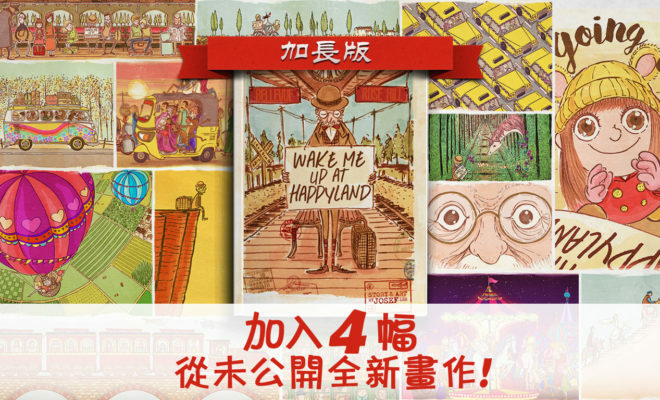 We have reached 50% of target and will be giving a FREE 「Taiwan-themed」 postcard to all backers! We have reached 30% of the target in 2 weeks! To thank all our supporters, we will be making this an ‘Extended Edition’, and will include 4 additional, never-seen-before artworks! Definitely a collectible item for those who have seen and enjoyed the online version. 的 著色本x1 換成 吊飾x1 嗎? 這樣金額將調整成多少呢? © 2018 FLiPER Creative Inc. All Rights Reserved.